Is Socialism on the Winning Side of History? Socialism is a joke. It doesn’t work. And it is so often a gateway to totalitarianism. But that doesn’t mean it won’t happen. In this interview, I express my concern that the United States has passed a tipping point. In the discussion, I included my usual caveat about the meaning of socialism. I prefer the technical definition, which involves government ownership of the means of production, central planning, and government-dictated prices. But most people assume it simply means big government, in which case it’s hard to find nations that don’t qualify. Regardless of the best definition, the reason for my pessimism is simple. It’s a combination of changing demographics and poorly designed entitlement programs. For all intents and purposes, we’re on a trajectory (the “most predictable crisis in history“) to become another Greece. The good news is that we probably have a couple of decades before the crisis occurs. The bad news is that our political class seems to have no interest in the reforms that would be necessary to avert the crisis. Though maybe the crisis will occur sooner than we think. I wrote back in 2015 that the debate between Hillary Clinton and Bernie Sanders was merely a discussion over how fast we should drive in the wrong direction. Well, Crazy Bernie didn’t get the nomination, but he seems to have won the war for the soul of the party. As I point out in this second clip, the radicals are now in the ascendancy on the left. By the way, here’s the interview with Thomas Sowell that was used as a lead-in to my interview. He may be even more pessimistic than I am. Though you’ll notice that Professor Sowell included a caveat, speculating that maybe there will be some unforeseeable development that saves the western world (or perhaps just the United States) from gradual decay. Let’s close this column with some optimism on that point. I’m old enough to remember the malaise of the 1970s, which wasn’t just based on the economic mess caused by Nixon-style and Carter-style statism. Many people also thought capitalism was no better than communism and that we needed to find some sort of middle ground (and some economists were horribly guilty of this sin). Thankfully, Reagan had a different approach (including mockery rather than moral equivalence) and the western world won the Cold War. I’m not an optimist about the future of Europe, mostly because welfare states are unaffordable in nations suffering from demographic decline. Given the grim trends on the continent, I expect many other nations (probably led by Italy) will experience the fiscal and economic mess that we’ve seen in Greece. Let’s dig into this issue by reviewing a story in the New York Times about economic stagnation in Europe, focused mostly on Spain. After decades of living comfortably in Spain’s upper middle class, the middle-aged couple are struggling with their decline. Spain’s economy, like the rest of Europe’s, is growing faster than before the 2008 financial crisis and creating jobs. But the work they could find pays a fraction of the combined 80,000-euro annual income they once earned. …Since the recession of the late 2000s, the middle class has shrunk in over two-thirds of the European Union…they face unprecedented levels of vulnerability. So why are middle-class workers in such bad shape? As you read the article, you find references to factors such as the “financial crisis” and “weakened social protections,” but no coherent explanation for why the private sector is languishing. Unless you read all the way down to the 22nd paragraph, where you finally get an interesting detail that probably explains much of Spain’s economic malaise. Taxes are so absurdly high that a guy with a modest income only gets to keep one-third of the money he earns! This is such a jaw-dropping factoid that I’ve made it an image rather than an indented excerpt. Wow, the confiscatory tax rates that Alexandria Ocasio-Cortez and Bernie Sanders want to impose on “rich” people in the United States already are already being imposed on low-income taxpayers in Spain. No wonder Spaniards are so inventive about avoiding taxes. And this story is a perfect example of why I constantly warn that European-type redistribution policies in the United States would result in much higher taxes for lower-income and middle-class taxpayers. By the way, you probably won’t be surprised to learn that the current Spanish government (just like a previous Spanish government) wants to make a bad situation even worse. Prime Minister Pedro Sánchez… The Socialist leader grabbed power last summer with the fragile backing of Podemos, the left-wing anti-austerity party. Warning of middle-class frustrations, his embattled government ordered a 22 percent rise in the minimum wage in January, and has vowed to reverse some labor laws, increase social spending and raise taxes on companies and the rich. There’s an election in April, so we’ll see whether Sánchez’s plan to impoverish his country actually gets adopted. My only prediction, based on what’s happened in the past, is that tax increases will not be successful. P.S. The story has two additional excerpts that help to explain Spain’s anemic performance. We have very strong evidence in the United States that unemployment benefits subsidize joblessness. Spain appears to be learning the same lesson, though the government still pays people to be unemployed for 1-1/2 years. Unemployment benefits…that state money, with budget cuts, now lasts 18 months, down from 24. I’ve also written about how so-called labor-protection laws discourage hiring. Well, seems like Spain is a very grim example of how this type of intervention backfires on intended beneficiaries. …temporary and part-time contracts…can lead to steady work and better incomes. But companies and Europe’s public sector have mostly used them to dodge protections for permanent employees. In Spain alone, 90 percent of new jobs in 2017 were temporary. P.P.S. Spain has a member of the Bureaucrat Hall of Fame, though the guy who “put a decimal point in the wrong place” probably also deserves induction. P.P.P.S. Here’s a sobering look at pre- and post-1990 growth in Spain and Poland. Today, Part III will look at the ongoing deterioration of Greece. 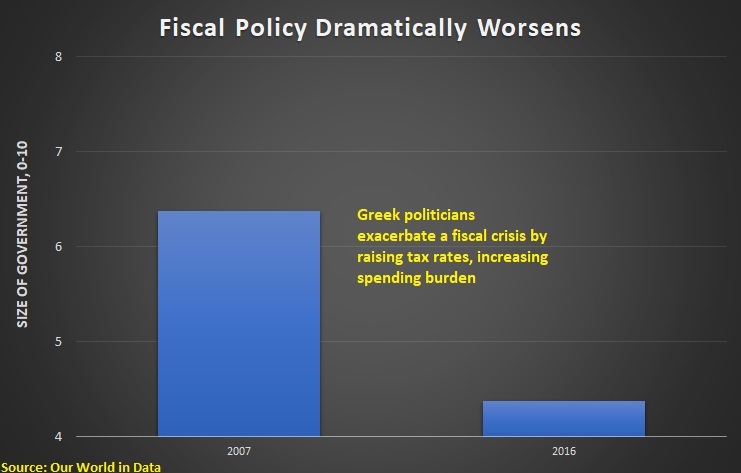 I’ve written many times about how the mess in Greece was caused by an ever-rising fiscal burden. 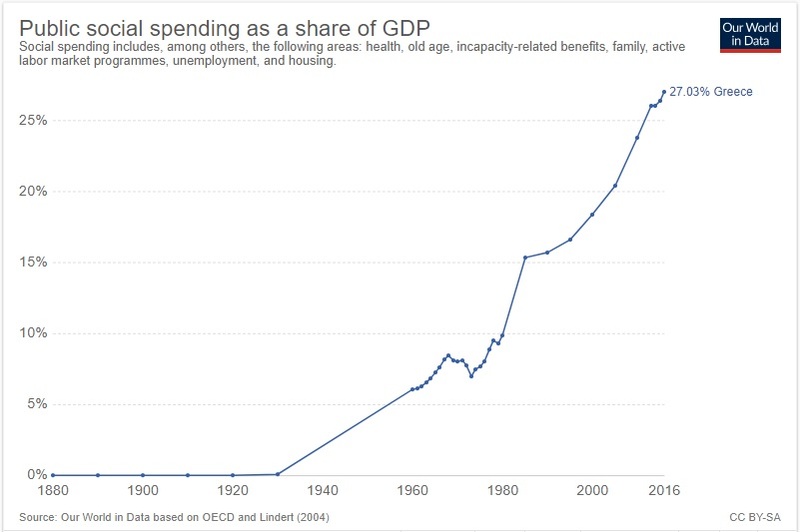 Let’s look at two charts, drawing from the government spending section of Our World in Data, that confirm my argument. 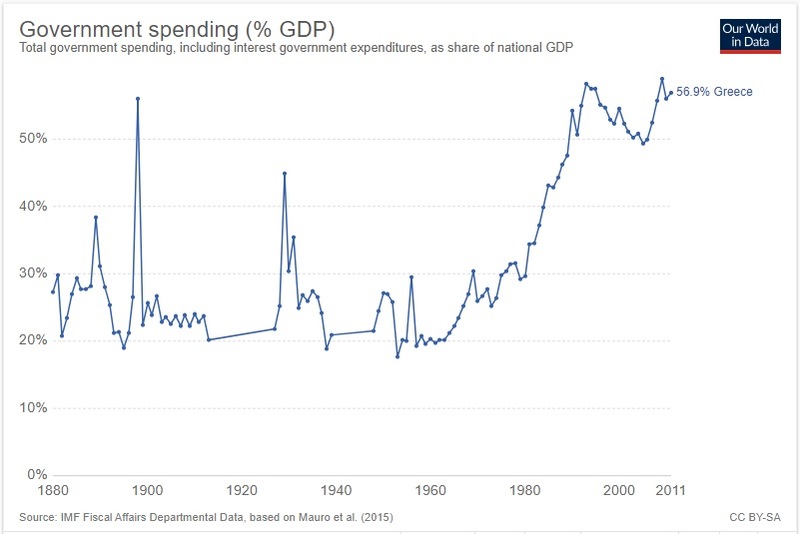 This first chart shows the overall burden of government spending starting in 1880. 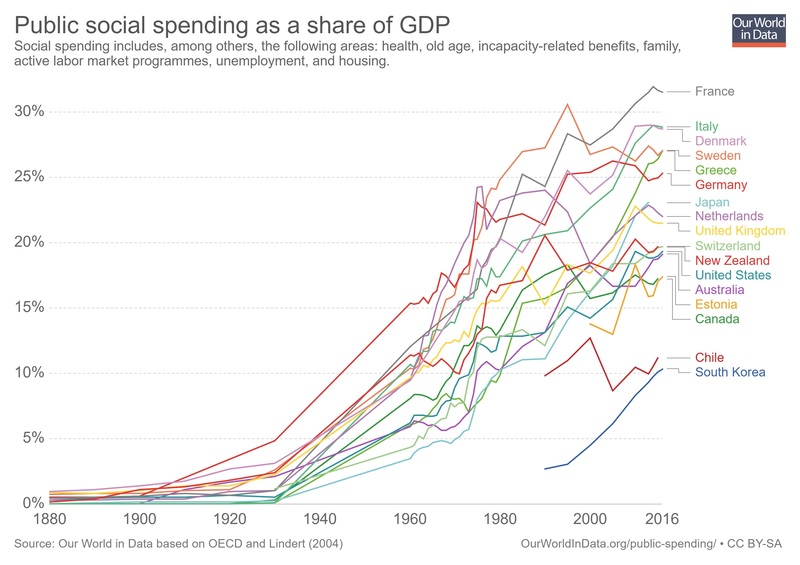 As you can see, spending generally consumed a bit more than 20 percent of the nation’s economy (other than during wars) all the way from 1880 to the mid-1960s. And then the spending burden exploded. What drove that unfortunate increase in the spending burden? We get that answer in our next chart, which shows that redistribution outlays have skyrocketed in recent years. In other words, the welfare state is 100-percent responsible for the Greek fiscal crisis, whether you look at short-run data or these long-run numbers. Has all this additional spending generated any good results? As government has become larger and crowded out the private sector, that has dampened hopes for the Greek people. As reported by the Washington Post, they are responding with fewer children and more emigration. During the country’s deep and prolonged crash, which began in late 2009 and worsened in 2011 and beyond, an already low birthrate ticked down further, as happened throughout the troubled economies of southern Europe. Greece was also hit by a second factor, with half a million people fleeing the country, many of them young potential parents. …Greece’s fertility rate, of about 1.35 births per woman, is among the lowest in Europe, and well below the rate of 2.1 needed for a stable population… In 2009, just before the fiercest parts of the crisis, there were 117,933 births in Greece. The number has since fallen steadily, becoming well eclipsed by the number of deaths. The birth total in 2017, 88,553, was the lowest on record. This chart from the story is amazing, though in a very grim way. This demographic implosion might not be a big problem if Greece was like Hong Kong and had a privatized system for Social Security. But that’s obviously not the case. Instead, Greece is a morass of expensive entitlements. Notwithstanding all the bad news, special interests in Greece continue to lobby for more spending and favors. And they have allies in Europe, as indicated by this report in the EU Observer. Dunja Mijatovic, the CoE’s commissioner for human rights, told EUobserver that Greeks are still suffering from the aftermath of international bailouts and imposed economic structural reforms. …Her comments follow the publication of her 30-page report on the impact of austerity measures in Greece, which says the fallout has violated people’s right to health, enshrined in the European Social Charter, and eroded the quality of schools. …Mijatovic, who toured Greece over the summer, says she was struck at the large cuts in areas like maternal and child health services. Though I want to be fair. There is occasional progress in the country, as indicated by another story from the EU Observer. Greece has taken one step closer to the separation of church and state by removing 10,000 church employees off the public payroll. A deal agreed between prime minister Alexis Tsipras and archbishop Ieronymos II also includes a settlement of a decade-old property dispute between the Greek state and the Orthodox Church – which is one of the country’s largest real estate owners. I consider this a small step in the right direction. The Israeli government may even want to learn something from this reform. And there are other hopeful signs, as illustrated by this story from Der Spiegel. Olga Gerovasili, …administrative reform minister…is overseeing an administrative overhaul that could transform the country like nothing else has since Greece joined the EU. She wants to abolish Greek clientelism. …For centuries, the Greek administration was little more than an excuse for legal nepotism. …Relationships were more important than skills for filling official positions. …Job appointments are no longer to be in the hands of powerful local politicians… The aim of the system is also to use it to remove incompetent officials. …Another revolution. The Greek administration was legendarily labyrinthian. Files could travel for years through dozens of official offices. When bureaucrats aren’t hired for their skills, they need to justify their existence by signing as many things as possible. …Much like the nepotism, this is also to become a thing of the past. I hope these reforms are real and permanent. After all, a bloated and inefficient bureaucracy is one of the primary causes of excessive spending in Greece. But time will tell. After all, it’s not easy taking away goodies from an entitled population. “Greece finally needs to open its markets — that’s the most important thing,” says Aristides Hatzis, 51, a law professor at the University of Athens. Hatzis has written one of Greece’s most surprising bestsellers of the past few years: an introduction to laissez-faire thinking. It’s surprising because economic liberalism doesn’t have any deep roots in Greece. …”In the past decades, the governments have so overwhelmingly failed that Greeks blame everything that goes wrong on the state,” says Hatzis. …”It’s difficult to take away the privileges of influential lobby groups.” As long as that doesn’t happen, he says, the country won’t recover. Having looked at the evolution of Greece’s economy, let’s now look at how the nation’s politicians have been responding to the crisis. Are they liberalizing, or are they digger the hole deeper? In other words, are the good reforms larger than the backsliding, or vice-versa? Naomi Klein will be happy with the answer. 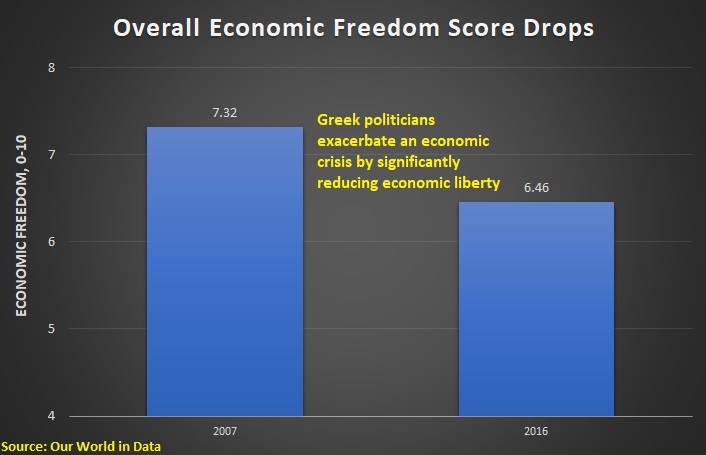 Here are two more charts, based on numbers from Economic Freedom of the World, both of which show that Greece is moving in the wrong direction. First, we see that Greece’s score has dropped over the past 10 years. And why has economic freedom declined? The main cause is that fiscal policy has become much worse, thanks in large part to the IMF and various bailouts (which actually were designed to bail out irresponsible banks in nations such as France and Germany). In any event, the nation’s politicians gladly accepted bad advice and used bailout money as an excuse to impose higher taxes, followed by higher taxes, and then decided to push taxes even higher. The bottom line is that it is difficult to be optimistic about Greece. Yes, there are some signs of hope. 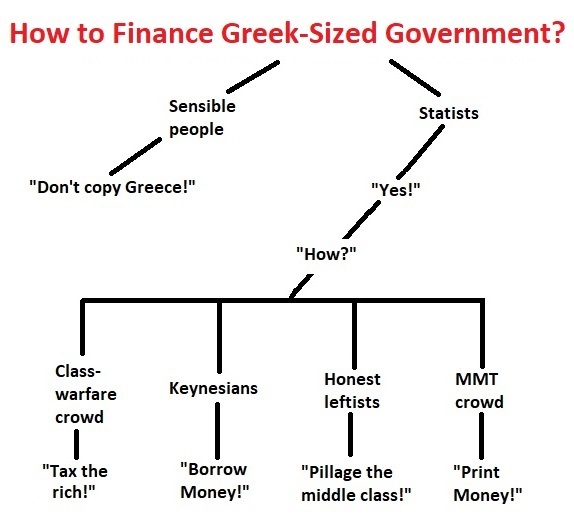 More and more people realize that big government has been bad for Greece. But it’s not easy to get good reforms in a nation where most voting-age adults are directly or indirectly mooching off taxpayers. P.S. Democratic socialism is better than totalitarian socialism, but it doesn’t produce good results. P.P.S. Folks on the left argue that Greece is not a good example of socialism. They say it’s a cronyist economy rather than a socialist economy. Given the various definitions of socialism, they’re both right and wrong. I’ll simply note that there are many state-owned enterprises in Greece and the government has been dragging its feet about auctioning them to the private sector. So Greece is definitely closer to socialism than Sweden. P.P.P.S. Here’s some Greek-related humor. This cartoon is amusing, but this this one is my favorite. And the final cartoon in this post also has a Greek theme. P.P.P.P.S. If you want some unintentional humor, did you know that Greece subsidizes pedophiles and requires stool samples to set up online companies? With the surprising success of Senator Bernie Sanders in the last presidential race and the more-recent instant-celebrity status of Representative Alexandria Ocasio-Cortez, some are wondering if the United States is about to enter a “socialist era”. I’ve criticized some of the proposals that are part of this movement, such as confiscatory tax rates and the so-called Green New Deal, so it goes with saying that I’m not a fan. To learn more about the implications of socialism, let’s look around the world. We’ll start with Venezuela, which is the focus of a very interesting article in the Washington Post. Here are some excerpts. Did socialism kill Venezuela? Blessed with the world’s largest oil reserves, this South American nation was once the region’s richest per capita. Twenty years after the launch of the late Hugo Chávez’s Bolivarian Revolution, it is now one of the poorest. …In Washington…Republicans are seizing on Venezuela to score points against those Democrats who have newly embraced the term… But socialism’s role in Venezuela’s collapse, observers say, is not as clear as either side likes to think. At least fleetingly, socialist policies propped up by state petrodollars helped bolster the country’s status as one of the Western Hemisphere’s most equitable societies. But state-heavy policies that distorted prices and exchange rates, coupled with corruption, mismanagement and official repression, turned Venezuela’s economic landscape into scorched earth. …But it is also not communist Cuba or North Korea, where foreign investment and private ownership are strictly limited. …wealthy Venezuelans still own private companies and high-walled mansions in elite neighborhoods. They play golf at country clubs and are taxed at a relatively manageable 34 percent. This is very fair reporting. All the main points are accurate: Living standards have plummeted in Venezuela, oil money complicates the analysis, and the economy isn’t quite as statist as Cuba and North Korea. The article goes on to cite the views of several Venezuelans. 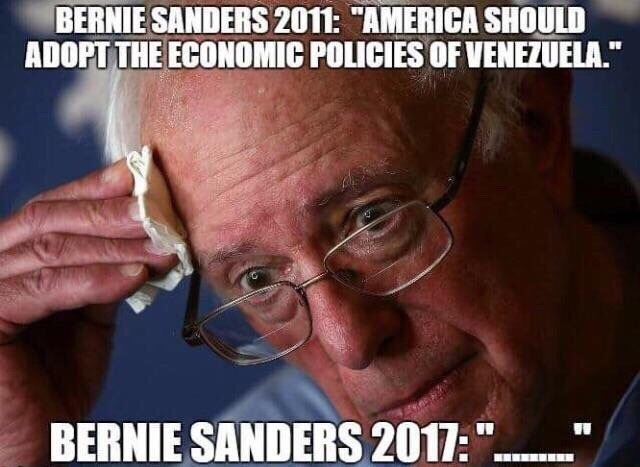 I’m glad that many Venezuelans now realize that socialism is misguided. Though I wonder if they will support the reforms that will be necessary once the current regime is deposed (and given the perverse incentives of politicians, I’m even more worried whether a new government will implement those reforms). The article concludes with some damning data on the country’s economic decay. State health care, once a pride of the socialists, collapsed as hyperinflation and shrinking resources left hospitals with shortages of syringes and antibiotics, as well as broken equipment too expensive to repair. …Chávez purged skilled managers, engineers and technicians from the state-owned oil giant PDVSA, stocking it with government loyalists. That set it up for a catastrophic failure as global prices fell from record highs. Venezuelan oil output is now at its lowest levels since the 1950s. Industries nationalized by Chávez, who expropriated 1,500 companies, collapsed as regulated prices distorted markets. In two decades, the government seized nearly 5 million acres of productive farmland that has now been largely abandoned. In 1999, there were 490,000 private companies in Venezuela. By last June — the most recent count available — that number had fallen to 280,000. None of this is a surprise. Venezuela is a basket case. But that’s not our topic today. We’re focusing instead on whether there are any lessons that the United States can learn from the Venezuelan debacle. Or, to be more accurate, I think the key question is whether advocates of democratic socialism in America have learned anything from Venezuela’s miserable performance. Plenty of leftists, including Sen. Sanders, praised the awful policies of Chavez and Maduro. Now that the chickens have come home to roost and Venezuela’s economy has tanked, have any of them apologized? Or tried to rationalize what happened? Or even expressed second thoughts about the supposed wisdom of socialism? It seems like every Democrat in the country plans to run against Trump in 2020 and presumably all of them will feel compelled to issue manifestos outlining their policy agendas. Which gives me lots of material for my daily column. I’ve previously written about statist initiatives from Bernie Sanders and bizarre ideas put forth by Elizabeth Warren. Today, let’s review the two big ideas that have been unveiled by Kamala Harris, the Senator from California who just announced her bid for the White House. We’ll start with her idea to create a federal subsidy for rent payments. I wrote about this new handout last year, and warned that it would enrich landlords (much as tuition subsidies enrich colleges and health subsidies enrich providers). Here’s some of what Professor Tyler Cowen wrote for Bloomberg about the proposal. One of the worst tendencies in American politics is to restrict supply and subsidize demand. …The likely result of such policies is high and rising prices, restricted access and often poor quality. If you limit the number of homes and apartments, for example, but give buyers subsidies, that is a formula for exorbitant prices. That is what makes early accounts of Senator Kamala Harris’s economic plans so disappointing. …Consider Harris’s embrace of subsidies for renters, as reflected by her recent sponsorship of the Rent Relief Act of 2018. Given the high price of housing in many parts of the U.S., it is easy to see why the idea might have appeal. But the best and most sustainable way of producing cheaper housing is to build more homes and apartments. The resulting increase in supply will cause prices to fall… That is basic supply and demand, with supply doing the active work. The Harris bill, in contrast, calls for tax credits to renters. …There is an obvious problem with this approach. If you subsidize renters, that will push up the price of apartments. Furthermore, economic logic suggests that big rent increases are most likely in those cases where the supply of apartments is relatively fixed, a basic principle of what is called “tax incidence theory.” In sum, most of the gains from this policy would go to landlords, not renters. In other words, this is a perfect plan for a politician who understands “public choice” theory. Ordinary voters think they’re getting a freebie, but the benefits actually go to those with political influence and power. Now let’s look at her $2.7 trillion tax cut. I believe that people should be allowed to keep the lion’s share of any money they earn, so my gut instinct is to cheer. But it’s always good to be skeptical when a politician is offering something that sounds too good to be true. Kyle Pomerlau of the Tax Foundation has done the heavy lifting and looked closely at the details. He has a thorough explanation of her plan and its likely impact. 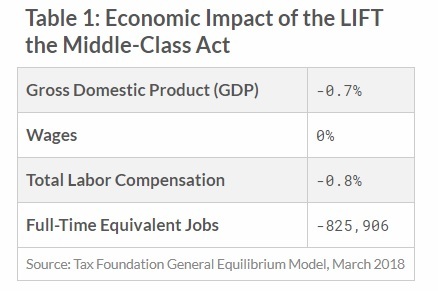 The “LIFT the Middle-Class Act” (LIFT) would create a new refundable tax credit available to low- and middle-income taxpayers. …LIFT would provide a refundable credit that would match a maximum of $3,000 in earned income ($6,000 for married couples filing jointly). …The credit would begin to phase out for single taxpayers starting at $30,000 of adjusted gross income (AGI) and $80,000 for single taxpayers with children, and begin phasing out for married taxpayers at $60,000 of AGI. The phaseout rate for all taxpayers would be 15 percent. …LIFT’s impact on the economy is primarily through its effect on the labor force. LIFT phases in from the first dollar of earned income to the maximum credit of $3,000 per tax filer. It then phases out starting at different levels of income, depending on a tax filer’s marital status and whether they have children. These phase-ins and phaseouts create implicit marginal subsidies and tax rates that impact individuals’ incentive to work. At the risk of oversimplifying, Harris is proposing a new version of the earned income credit. And that means some taxpayers get subsidized for working and some taxpayers get penalized. For taxpayers in the credit phaseout range, tax liability would increase by 15 cents for each additional dollar earned. This means that these taxpayers would face an additional implicit marginal tax rate of 15 percent, which would reduce these taxpayers’ incentive to work additional hours. In contrast, taxpayers in the phase-in range of the credit would get $1 for each additional $1 of income they earn. As such, these taxpayers would benefit from an effective marginal subsidy rate, or negative marginal tax rate, of 100 percent. A negative tax rate of 100 percent would increase the incentive for these taxpayers to work additional hours. Kyle crunches the numbers to determine the overall economic impact. While the positive labor force effects of the phase-in of the credit could offset the negative effect of the phaseout, we find that, on net, the size of the total labor force would shrink under this policy. This is primarily due to the large number of taxpayers that would fall in the phaseout range of the credit relative to the number of individuals that would benefit from the phase-in. …We estimate that the credit…would reduce economic output by 0.7 percent and result in about 825,906 fewer full-time equivalent jobs. Here’s the relevant table from the Tax Foundation’s report. This is remarkable. It would seem impossible to design a $2.7 trillion tax cut that actually hurts the economy, but Sen. Harris has succeeded in that dubious achievement. For all intents and purposes, she has figured out how to have an anti-supply-side tax cut. And there are two other problems that deserve attention. First, as noted in Kyle’s paper, the tax cut is “refundable.” This means that money goes to people who don’t pay taxes. In other words, it is government spending being laundered through the tax code. So Harris claims to be cutting taxes, but part of what she’s doing is expanding redistribution and making government bigger (and encouraging more fraud). Second, Harris is very cagey about how the numbers work in her proposal. Does she want the tax cuts (and new spending) financed by more borrowing? By printing money? By offsetting class-warfare tax increases? Some combination of the three? Whatever the answer, the negative economic damage will be substantially higher if financing costs are included. Considering the poor design and upside-down economics of the rent subsidy scheme and the new tax credit, the bottom line is rather obvious: Kamala Harris wants to buy votes, and she has decided that it is okay to hurt the economy in hopes of achieving her political ambitions. No wonder she fits in so well in Washington!